Providing safety and guidance for people who live in areas where disaster is a regular part of existence, the La Crosse 810-805 weather radio does what it is engineered to do and performs exceedingly well. It is a high-quality digital radio that provides weather information and alerts especially during the most critical times. This is a highly portable handheld unit that allows you to keep it with you at all times so you can keep updated on vital information for your area anywhere you go. 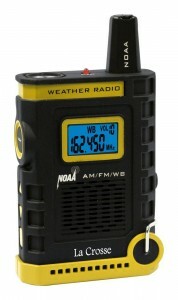 The weather radio provides versatile use as well with its multiple functionality. Reception is stable and clear when properly set. The main drawback for this weather radio is it is not powered through alternative sources, unlike larger models that feature a turbine for hand cranking or solar panels to harness power from the sun when batteries fail or a power outage occurs. This would enable use on the road especially when the unit is made part of typical travel gear. Being able to use the weather radio even when no batteries are immediately available or when a 6 volt AC adapter is not purchased gives flexibility to the user. The unit works really well with the specified power source so you had better stock up on batteries to make the most of the weather radio. Able to pull in all seven weatherband channels, the La Crosse 810-805 is an indispensable piece of equipment when going camping, boating or hiking. It offers alerts on impending weather situations that can affect your area. Get updated weather alerts and information even when conditions are not exactly ideal, since the blue backlight on the display changes to red when a weather alert is imminent. This helps you keep tabs on weather events at home and on the go. Its portable size, along with the included lanyard, facilitates effortless carrying anywhere so you are always updated on critical weather situations no matter what activity you are engaged in. During power outages when the nights are especially dark, this affordable weather radio provides illumination thanks to its built-in push button LED flashlight. This component ensures that you have lighting even when the surroundings remain dark. You can find your way easily with the flashlight and ensure safety for you and your loved ones. In addition to the seven weather channels, one can also pull in AM and FM channels, which means you can listen to your favorite radio programs, music and talk shows to help you get entertainment for yourself and the family. This helps mitigate the impact of severe weather disturbances on your normal life, so you somehow feel a sense of balance amidst the chaos. 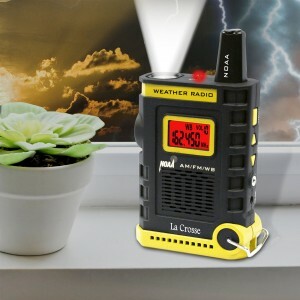 Equipped with an integrated IC Chip, this weather radio provides dynamic bandwidth filtering and automatic frequency control so you enjoy extra-clear reception, which helps you feel secure that you are in touch with the outside world despite any severe weather disturbance that can subject your location to chaos. The telescoping antenna can be extended to obtain a steady and powerful signal on the weather channels, as well as the AM and FM radio channels. For indoor use, the weather radio can be placed near a window to get the best reception. The unit is designed to withstand extreme temperatures up to 122 degrees Fahrenheit, both during operation and storage.